This call from Willie Banks this 1991 night was to his mother. The occasion was his first call to the big leagues. But it was other calls, and her simply raising him to be the man he became, that helped get him there in the first place, he told The Los Angeles Times. "She was the one I would call during all the low points," Banks told The Times of his run-up to the bigs. "I remember after one bad game in Double-A, I was about to cry over the phone. She gave me a pep talk, told me not to put too much pressure on myself." From that upbringing and that first trip to the majors, Banks went on to pitch in a total of nine big league seasons, part of a professional career that spanned more than two decades. Banks' career began in 1987, taken by the Twins in the first round, third pick overall, out of St. Anthony's High School in Jersey City. 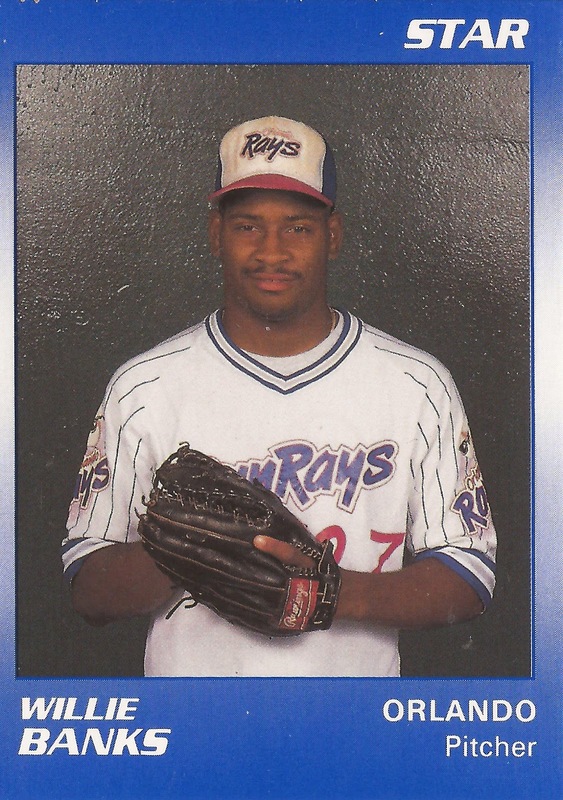 He started at rookie Elizabethton, moving to single-A Kenosha in 1988 and then AA Orlando full time in 1990. He made AAA Portland in 1991 then, that July 31, Banks made Minnesota. With the Twins in 1991, Banks got into five games, starting three. He went 1-1, with a 5.71 ERA. He returned 16 more outings, 12 starts, in 1992, then 30 starts for the Twins in 1993. He went 11-12 in 1993, with a 4.04 ERA. For 1994, Banks went to the Cubs in a trade, going 8-12 on the shortened season. In one late EJune start, Banks set down 20-straight batters in a Cubs win, after 11 days off. "I felt too strong after those days off," Banks told The Associated Press after the win. He told his pitching coach the same thing. "He said, 'Better too strong than too weak.' He had a point there." Banks returned to the Cubs for 1995, moving mid-year to the Dodgers and then the Marlins. He's not recorded as playing in 1996, out due to injury, but returned in 1997 to play five games with the Yankees. His return to the Yankees saw him pick up a save in September, saving a win for his idol Dwight Gooden, The New York Daily News wrote. He had also been a childhood fan of the Yankees. "I kind of feel like break-dancing," Banks told The Daily News. "Everything I've pretty much wished for, happened in one night." Banks went on to play in three more major league seasons, in 1998 with the Yankees, and in 2001 and 2002 with the Red Sox. Banks played one more year in the minors, then moved to independent ball, at Newark, with the Bears. Then his mother died, the one he had leaned on so much growing up and early in his career. He then left baseball, and pretty much everything else, according to The Bergen County Record. In 2009, though, he returned to baseball and the Bears, and again for 2010. "Baseball was always that outlet for me to release everything," Banks told The Record in May 2010. "And without baseball, I'll be honest with you, I wouldn't be nobody. ... That's what I do. That's what I am. And I love the game. I’m going to play it till this arm falls off."